Over the past year or so, several of our readers have mentioned to us their need for apologetics-based instructional material aimed specifically at men and women who are incarcerated in jails and prisons—something that could be sent into that environment to help people build a rock-solid, obedient faith in God, His Word, and His Son, and simultaneously teach them the Gospel plan of salvation so that they, too, could become a member of Christ’s singular, heaven-sent, blood-bought church. The material, they explained, needed to be attractively presented, brief, and written with a non- technical vocabulary that would be appropriate for all ages and cultural backgrounds. Ironically (or maybe not! ), about the same time, we began to receive requests for a correspondence-course type study in apologetics that could be used to teach young people these same principles. We were informed that it needed to be attractively presented, brief, and written in a non-technical vocabulary that would be appropriate for several ages and cultural backgrounds. “Hmm,” we thought, “two pretty tall orders.” Then, suddenly, CLICK!—we experienced the “light bulb above the head” syndrome. Why not produce a Christian evidences correspondence course that could be used by both groups? And so that is exactly what we set out to do—and exactly what we have done! Our new Christian Evidences Correspondence Course has 10, 8-page lessons, each of which is printed in full color on enameled paper in a large, easy-to-read typestyle, and contains professionally drawn artwork (see samples below). Lessons are written in an everyday vocabulary that will be appealing to young people, as well as to those who are incarcerated. Each lesson stands on its own, and contains written exercises on a perforated sheet so that students may hand (or mail) them in for grading. Sets are shrink-wrapped, and contain a separate answer sheet for the teacher’s use. 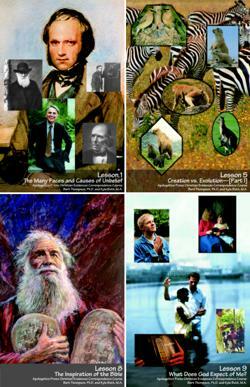 The 10 lessons cover the following topics: the faces of unbelief; the existence of God (3 lessons dealing with cause and effect, design, and morality); creation vs. evolution (2 lessons); a general introduction to the Bible; the inspiration of the Bible; what God expects of me (i.e., the Gospel plan of salvation); and the uniqueness and singularity of Christ’s church. Currently, we are working on a second, intermediate course (to be released later this year), and we have a third, advanced course planned as well (for release early in 2002). As with all of our products, we have done everything possible to make them as professional, yet as affordable, as possible. Cost for a set of 10 lessons is only $4.00 ($3.50 each in quantities of 26 or more). Individual lessons are available for 40¢ each in quantities of 25 or less (35¢ each in quantities of 26 or more). To order, call us toll free at 800/234-8558.